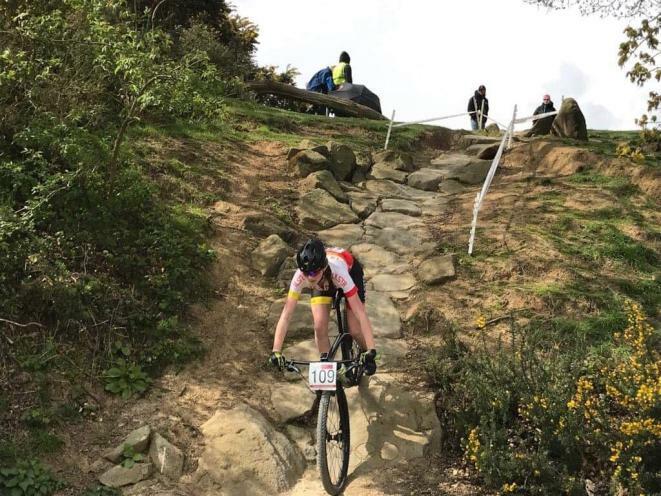 Last weekend the Cycling Ulster off-road riders competed at Round 2 of the British National mountainbike series which was based at the Olympic Games venue at Hadleigh Park, Essex overlooking the Thames estuary. Some of the riders had been there before for the inter-regional games but quickly found that the full Olympic configuration track was a different beast altogether. Nevertheless they got down to work on Saturday with Cycling Ulster coaches Gareth McKee, Graham Boyd and Mark Harvey to work their way round the technical features during practice so that they had their riding dialled to perfection by the end of the day. Sunday morning saw four young riders in the 9 am races with Cycling Ulster represented by Dean Harvey and Ryan Skelly. Dean would go on to have one of his best races competing strongly in the front group to finish 7th at the flag. Ryan made his debut for the team to record a 29th place finish. No mean achievement in such a large field of riders. Travis Harkness riding for his Carn Wheelers club scored his best result with a fighting 9th place in U14 boys with VC Glendale rider Aine Doherty continued her strong start to her debut season in 5th place in U14 girls. Next up were the junior women with Niamh McKiverigan and Darcey Harkness taking to the start line in Cycling Ulster colours. 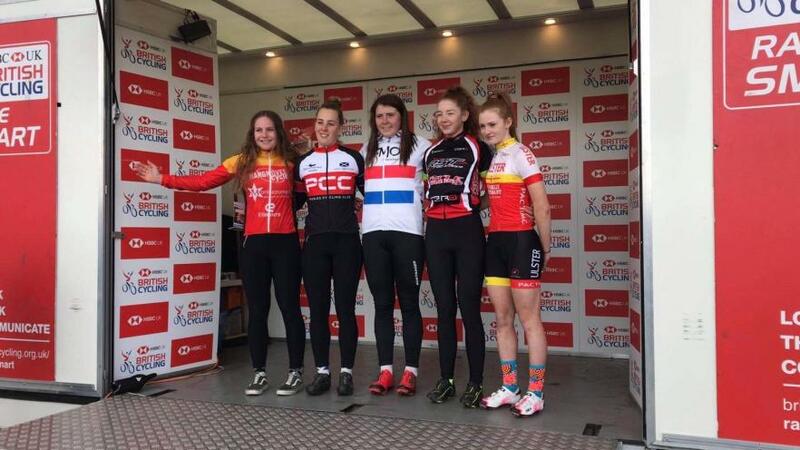 Both would have great races, Niamh was to race to her first podium position in this UCI category race. An achievement all the more impressive when considering that she had broken and dislocated her finger during practice the day before. Niamh refused to go to hospital, instead having her finger put straight back into place in the back of an ambulance in order that she wouldn’t be ruled out of the race. 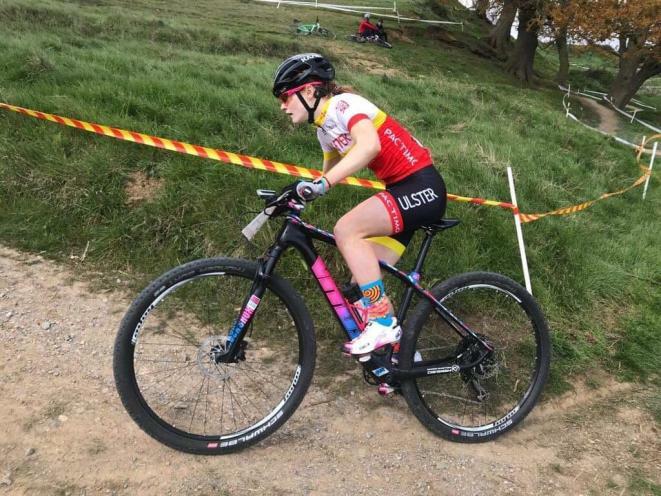 Following close behind was Darcey in 6th position, a great ride for this first year junior and a credit to the amount of work she put in on the Saturday during practice to ensure that she could race down the A line sections on the course. Junior men were next up with Lee Harvey for Cycling Ulster. Lee fought hard throughout the race in a race long battle for podium positions. Starting the last lap in 5th place he was unfortunate to be shuffled back to 7th but a strong return to form on a tough course for Lee. Elite men would see Cycleology racing’s Gareth McKee and McConvey Cycles Graham Boyd caught up in a tangle off the start line which left the pair last out of the arena. Both set to work to come back through the field but a host of top foreign riders would see Gareth finish 26th with a few problems leading to a rare non finish for Graham. Overall a strong performance from our guys as they continue to improve at this level.